Author with story contributors – whose parents and grandparents ran the general store. 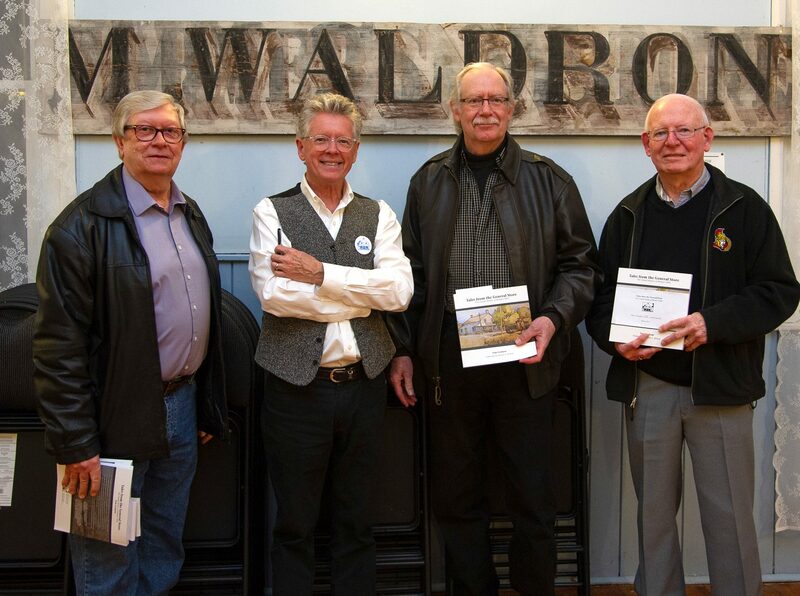 L-R: Ray Adams, Author Tom Graham, Glen Adams, Winston McLellan. Photo by Steve Roberts. Tales of community resilience came alive during a talk given by local author Tom Graham at the launch of his new book. Tales from the General Store – the Untold History of Bishop’s Mills is the culmination of years of gathering stories from the lived experiences of many local residents. It was standing room only at the Book Launch, which was held in the Bishop’s Mills Community Hall on Tuesday, March 26. Tom’s presentation included photographs from the past, about how he became interested in history, as well as many tragic and everyday events in the village. There were audible gasps in the audience when the detailed animation of what is known as ‘The Great Fire’ was shown. Attendees included many local residents, past and present, plus local North Grenville Council representatives. In addition, special guest, David A. Bishop, great-great-grandson of village co-founder Chauncey Bishop. Mr. Bishop came from the Toronto area to attend the event and was recognized for his generous donation of copies of the new book for the North Grenville archives and libraries. Following the presentation, refreshments were served while attendees were able to purchase a book and have it numbered and signed by the author. More information about the book may be found at www.HabitFive.com.